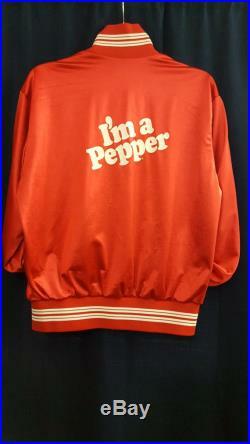 Rare vintage 70's dr. Pepper "i'm a pepper" satin snap-up varsity jacket. 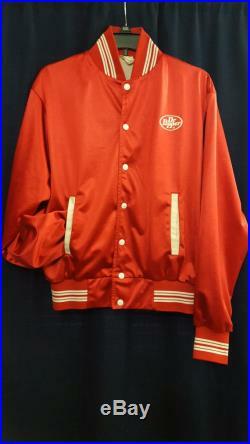 Red satin with white screen print of dr. Pepper logo on the front right beast, and slogan on the back. Red & white striped elastic cuffs, waistband & collar. White enamel snaps with minor chipping. Good condition with a few minor abrasions and a small stain (looks like pen ink) on the back of one sleeve. This was in my father-in-law's estate. He used to work for a dr. Pepper bottler in the late 70's and early 80's, so this may have been a promotional item from work. In my searches, i've only found 2 like it, and both were listed as rare.